Singh’s remarks come almost a month after a group of five Army commandos crossed the Line of Control in Poonch sector of Jammu and Kashmir and killed three Pakistani soldiers and smashed a post, in a swift and daring operation. Union Home Minister Rajnath Singh on Sunday said, India has shown it can attack its enemies not only on its soil, but also in a foreign territory, if need be. The operation was seen as avenging the killing of four Indian Army personnel by a Border Action Team of the Pakistan Army in Keri sector Rajouri district. “A few months ago, Pakistan, in an act of cowardice, attacked and martyred 17 of our jawans. Prime Minister Narendra Modi consulted all of us on this serious issue, and the Indian Army entered the Pakistani area and killed the militants,” Singh said at a public meeting here. “India’s image in the world has become that of a strong nation and we have given a strong message to the world that we can attack our enemies not only on our soil, but also in their territory. India has developed this power,” he said. Singh said India wants to maintain a friendly relationship with Pakistan. India to bow its head,” he said. The home minister said that under the leadership of Prime Minister Narendra Modi, the country’s economy is moving ahead at a fast pace.v “and now even the global economists and experts accept this,” he said, adding that India’s prestige in the global arena is “rising rapidly”. Singh was addressing a meeting of ‘Bharatiya Railway Maal Godaam Shramik Sangh’ here. “The ‘railway maal godaam shramik’ have, for the past few generations, been sweating and giving the Railways a good income. 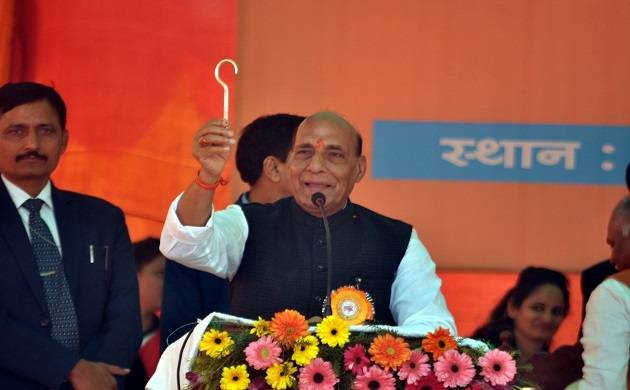 However, despite this, they do not have any identification card, nor do they get any treatment facility in any of the Railway hospitals,” said Rajnath. He said he would take up the issues and problems of the labourers in the railway sector with their representatives and the railway minister.